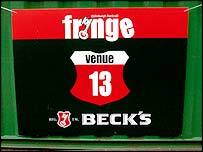 The Royal Welsh College of Music and Drama is celebrating 13 years of staging shows at the Edinburgh Fringe Festival - at Venue 13. The Cardiff-based college takes a clutch of students to the Scottish capital each summer to give them experiences of day-to-day showbiz duties. Would-be actors, writers, directors, stage managers, technicians and front of house staff are put through their paces to see whether stage life is for them. The mixture of budding talent and available audiences provides an opportunity for employers and agents to search for next year's stars. For most of the year, Venue 13 is actually the Harry Younger Hall and belongs to a local church at the bottom end of the Royal Mile, the Canongate Kirk. But each summer the church hall is re-invented as a 50-seater venue with stage lights, tier seating and front-of-house staff. It becomes one of the more than 320 Edinburgh sites which host acts for the fringe and, as one of the earliest venues, it took a name branding which many other venues have followed. 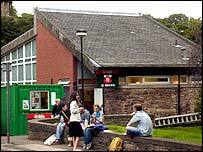 In 1992, the college sub-let the hall for a week to mount a number of productions featuring its students. Over the years, the commitment to hosting comedies, musicals and dramas has grown and in 2004, Venue 13's billing has had up to eight shows a day, between 1000 BST and 2315 BST. This year's schedule has included nine production companies, fourteen productions and more than 130 performances in 23 days. The college's head of stage management, Scotsman David Roxburgh, said: "Venue 13 is established as the centre for emerging Welsh talent at the Edinburgh fringe. "This has allowed the college to become more integrated with the Welsh theatre industry and become an active part in its success. "Most of Venue 13's staff are students of the stage management programmes at the college and the festival fringe project is an integrated option in their training. "It gives the students first-hand contact with a range of potential employers and is not considered to be a 'no-pressure' option. "A number of writers, directors and performers regularly approach the college to become a part of the season." This year's most successful production has been Dylan Thomas in America. The one-man play - adapted from the Welsh poet's letters, broadcasts and memoirs - starring Peter Read - was a hit with the critics. Another favourite was the 1998 production, Jolly Folly of Polly the Scottish Trolley Dolly, a one-woman musical which won the Guardian's best of the fringe award.